A stunning set that lovers of pink pearls will not be able to resist. A lovely natural creamy pink pearl long necklace in 8mm pink pearls creates a very Deco type design that will not date. Seen here on our stunning model Nikki, worn double, you can see by the warm tones how lovely it looks on olive skin but also looks amazing on a very pale complexion. Stunning really, in it’s simplicity this gorgeous combination of natural pink pearls with pink jasper gemstone disks, is stranded on shiny sterling silver, and is super versatile. 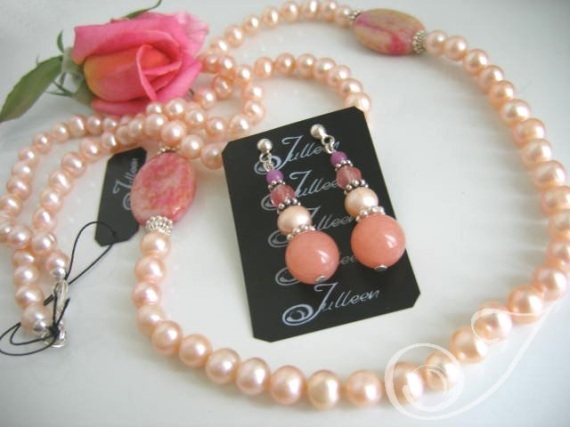 The earrings are combined with 10mm salmon pink jade, creamy pearls and facetted cherry quartz that are accented with 3mm hot pink jade beads, which brings out the fusion of delightful pinks. Jaye Necklace or Celia Cluster Earrings.